Who wants to have their cake and eat it too? Definitely me. I have a big sweet tooth and love love love cookies, brownies, cake, chocolate…basically any dessert. I will eat it. And that’s ok. I don’t say no to something if I really want it, except of course if it is something that I know will wreak havoc on my intestines. And even in that case I just find something comparable that I can eat and enjoy. So when I realized easter was coming up and I was craving carrot cake, I wanted to make my own version that was gluten free, not super sweet, and full of those carrot cake spices. 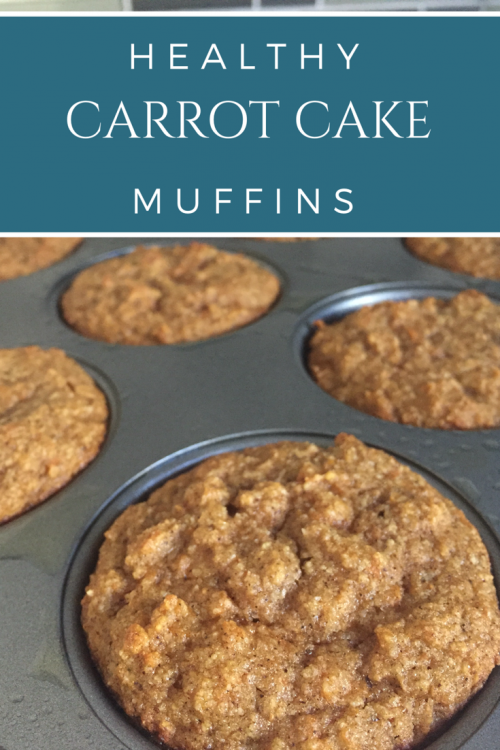 So I made these healthy carrot cake muffins for myself, and I guess my husband too, but mostly myself. 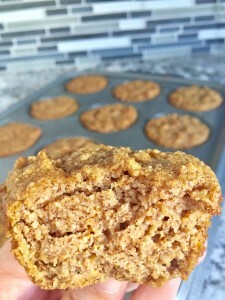 When I first made these healthy carrot cake muffins, I made a version that was a little higher in sugar (1/2 cup maple syrup instead of a 1/4 cup). It was good, but a little too sweet for a muffin, it reminded me more of a cupcake. And while I don’t really give my 15 month old daughter things with added sugar very often, I did put a few pieces of the muffin on her plate towards the end of dinner. I expected her to gobble it all down immediately but she didn’t. She had a few bites and then actually left some on her plate. While she did eat some of it, and enjoy it (she indicated this by making “mmmm” sounds), she listened to her body and stopped when she was full. I feel like that is a great lesson for us all! So how can you stop eating more than what you need? You are likely not a baby if you are reading this post (If you are, congratulations on reading so early! ), so you might feel like you have lost some of your ability to self regulate. Most of us preserve this function until about 2 years old but after that, external instead of internal cues can be more influential if we are not careful. I’m sure many of you were told growing up that you needed to “clean your plate,” and that there were “starving children” somewhere, and you were being wasteful. It was a different time then, and we know so much more now how these practices undermine our ability to self regulate. One thing I like to do is to take smaller portion sizes. If I am hungry I allow myself to get more, but it gives me time to pause and ask myself “am I still hungry?” or “do I really want more?” instead of just mindlessly eating everything off my heaping plate. 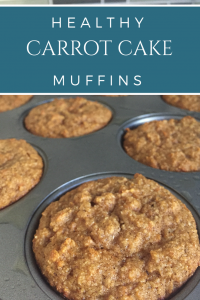 Anyways…lets get to those healthy carrot cake muffins. 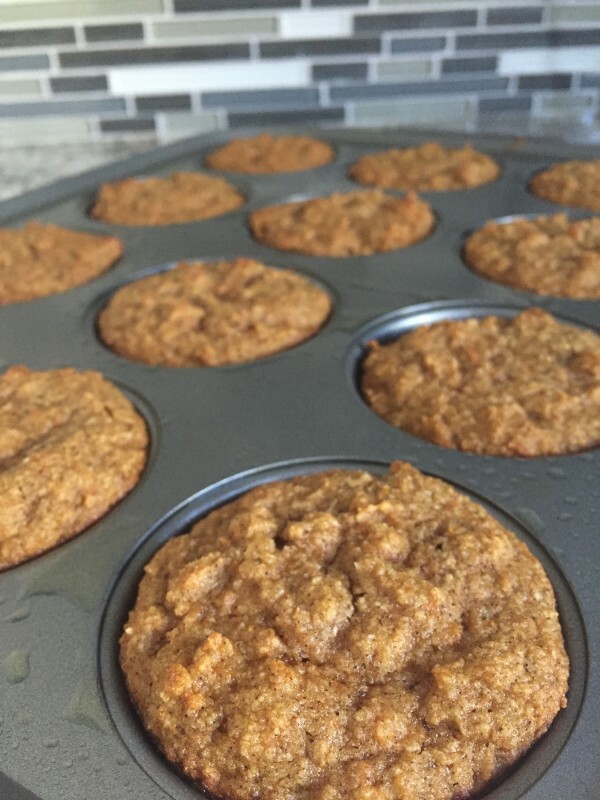 In order to turn a carrot cake with a limited amount of nutrients, into something healthier that is absolutely still delicious, I changed up a few ingredients and made it into muffins for easier portion control. Instead of all-purpose flour (very little nutrients) I went with an almond flour. 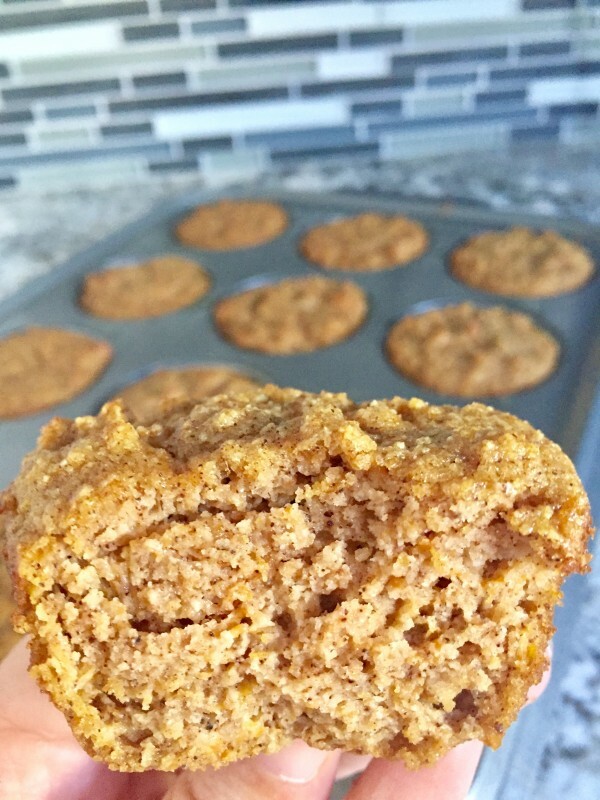 Never tried baking with almond flour before? It’s amazing. It is basically ground up almonds so you are getting healthy fats, protein, fiber plus other vitamins and minerals. It is really light and fluffy and…I just love the almond flavor. Because the almond flour contains fat in it, I don’t usually see the need to add any extra oil. So instead, I used some applesauce to give it some natural sweetness so I can cut back on the maple syrup. Oh and if you do want more of a cupcake then a muffin, just follow the recipe below but increase the maple syrup to 1/2 cup. Preheat oven to 350 degrees. 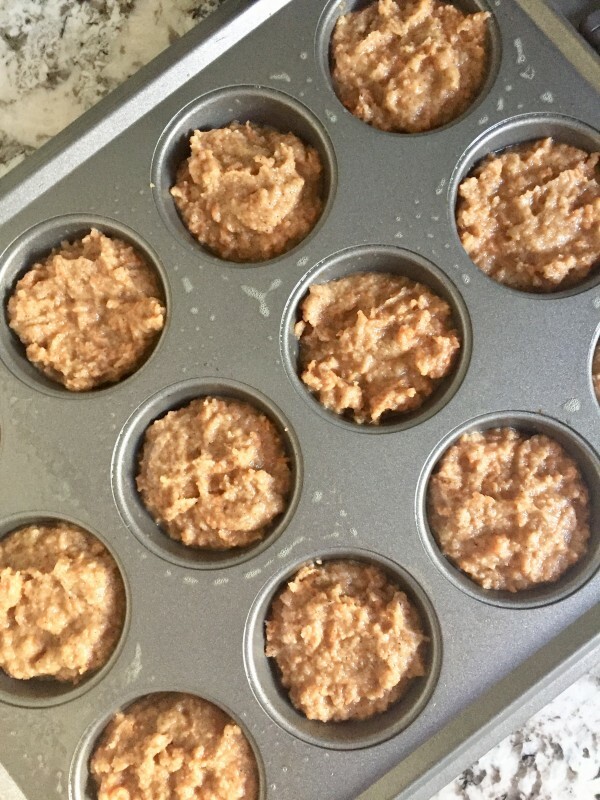 Spray a 12 muffin-muffin tin with cooking spray. Whisk together flour, baking soda, baking powder, salt and spices in a large mixing bowl. In a separate medium size bowl lightly beat eggs, maple syrup, applesauce, and vanilla. Stir wet ingredients slowly into flour mixture until consistent throughout. Fold in carrots. Fill muffin tin with batter evenly, about 1/2 to 3/4 way. Place in preheated oven and cook for 18-20 min or until edges are golden brown. Remove from oven and allow to cool. Use a knife or fork to loosen edges of muffins and remove from tin. Serve or keep in an airtight container until ready to eat. Want to get more great recipes and ideas in your inbox? Subscribe to receive our updates. Hi, and welcome to my website! My name is Caryn Fasko, and I am a registered dietitian nutritionist in Miami, Florida. Although, I was born and raised in Ohio. I am a busy working mom with an hour long commute to work, so I know how hard keeping up with healthy habits can be. I love eating healthy but I hate overly complicated recipes and doing dishes.